Even though the launch isn't for a few months. Still on track for release this summer, Charlie Murder now has a launch trailer! The quick 65 second video shows a dozen or so scenes from the game along with music that'll totally get your blood pumping. It doesn't divulge a lot of information, new or otherwise, but it's eye-catching and a great way to convince your pals to join in on the inevitable co-op "brawl-PG" fun. Previously on the Charlie Murder saga, developer Ska Studios leaked details about the item and ability systems in the game. 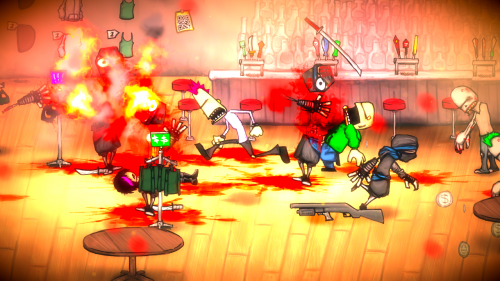 Charlie Murder is much more than a simple metal music-themed brawling game. It includes a surprisingly deep upgrade and equipment system that allows players to trick-out their characters from head to torso. Really, you can buy hats that let you stun enemies or shirts that are flame resistant. Also, you can get tattoos that upgrade your abilities, which is something real world tattoo parlors should really think about investing in. I'd even get a dolphin tattoo on my ankle it if gave me a boost in my pie eating skills. Charlie Murder will release sometime this summer on Xbox Live Arcade. It will support four player local and online play.